Posh manager Grant McCann (left) and chairman Darragh McAnthony are building a team of strong characters and winners. Grant McCann insists he will be managing a team full of winners and strong characters in League One this season. The Peterborough United boss has been playing a game of patience as he tries to assemble a squad capable of challenging for automatic promotion. Posh defender Michael Bostwick (right) remains a target for Rotherham United. But he’s confident two new faces will arrive before the squad jet off to Spain for a summer training camp next Wednesday (June 28). 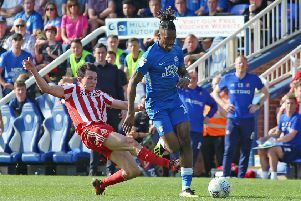 Posh are on the verge of signing a Premier League goalkeeper as McCann aims for quality over quantity for his second season in charge. “We will have the drive and determination in the squad next season that we were lacking last season,” McCann stated. “We have had targets in mind for a long time, but we’ve been patient in our pursuit of them. Our targets are wanted by other clubs, so it’s been a case of saying the right things to the player, the agent and their current clubs. Posh contract rebel Jermaine Anderson. “But we’ve agreed personal terms with two players and they want to come here. It’s just a question of working with other clubs to make it happen. “Ideally they will be here for the start of pre-season training on Monday (June 26), but if not before we go to Spain. “They are players that will definitely improve us. We will have a squad committed to winning promotion from League One. “The wheels fell off after Christmas last season and we know why. I’ve spoken to Brighton manager Chris Hughton this summer and he’s given me advice on how to keep the players going for an entire season. Since the end of last season Posh have signed attacking players Ricky Miller and Danny Lloyd from non-league clubs Dover and Stockport County respectively. They have also picked up back-up ‘keeper Josh Tibbetts from Birmingham City. McCann still hasn’t given up hope of signing goalkeeper Luke McGee from Spurs for a second season, but admits the Premier League club are not even ‘picking the phone up’ right now. McCann also warned contract rebel Jermaine Anderson not to dither for much longer on whether or not to sign a new deal. The Peterborough Telegraph understands League One rivals Rotherham United have stepped up their bid to sign transfer-listed defender Michael Bostwick. Left-back Jerome Binnom-Williams has joined League Two side Chesterfield after his contract at the ABAX Stadium was cancelled by mutual consent. Right-back Michael Smith is now a target for a Scottish Premier Division club as well as League Two side Coventry City.